Why do I need Wi-Fi protection? Encryption is not usually used in public Wi-Fi access points (for example, in airports or cafes). Anybody who is using a laptop or a smartphone near you could intercept or replace your personal data or read your emails. 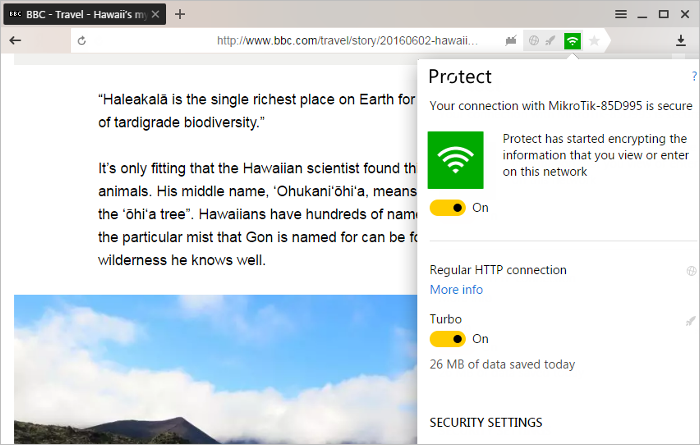 The Protect system in Yandex Browser uses a proprietary method for securing Wi-Fi connections. This mechanism is implemented in Yandex Browser for desktops, as well as in the mobile version for smartphones and Android-based tablets. When secure Wi-Fi is enabled, data sent over the internet passes through a special encrypted channel. The data transfer rate may be slightly slower, because the page is sent to the Yandex encryption server before it is returned to the user. Note. Wi-Fi protection is not used for websites that run on HTTPS, because this protocol already uses data encryption. If a site uses HTTPS, the SmartBox displays the icon or . As soon as the user connects to an unsecure network, the browser automatically secures the wireless connection. Protection is enabled, but some elements of the page (for example, images or video) cannot pass through a secured channel. Yandex servers are temporarily unavailable or Yandex can't access the website (for example, a corporate site). If you are not on a secured corporate website, avoid transferring confidential information or banking data until Wi-Fi protection is restored. If you are connected to your home Wi-Fi and see a Yandex Browser alert about an unsecured network, it means that the protection algorithm used by your router is not secure enough. Attention. The WPA2/WPA2-PSK protection algorithm is considered secure. In contrast, the WPA/WPA-PSK algorithm is less secure, The protection level when using the WEP algorithm is equivalent to no encryption. We strongly recommend using something other than WEP. Open the web interface for managing the router. Set WPA2 or WPA2-PSK network authentication type. For more detailed recommendations, please refer to your router's user manual. Attention. Disabling Wi-Fi protection will increase data transfer speed, but it puts your data at risk. We do not recommend that you expose yourself to this risk, especially if you are going to transfer your personal data or make e-payments. In the window that opens, change the setting to Off next to Secured Wi-Fi. After doing this, your data will stop passing through a secured channel, but the unsecured Wi-Fi alert will still be shown in the SmartBox. In theSecure connectionsection, enable the option Secure your network connection when connecting to public Wi-Fi networks.